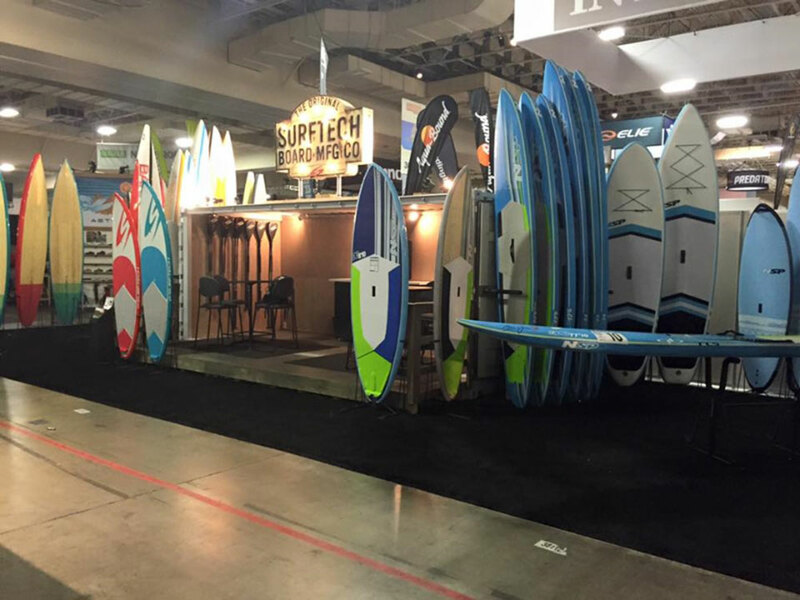 Surftech unveiled its highly anticipated new 2016 lineup of SUP’s and Paddleboards from NSP, BARK and Surftech yesterday at the Summer Outdoor Retailer on-water demo in Salt Lake City, Utah. The “Explore” collection is an entirely new direction for the 26-year-old brand and another big step in the company’s transformation that began in 2014. The collection covers everything from inflatables to elite racing boards with a heavy emphasis on touring and adventure paddling. This is the first time the NSP and Surftech brands have been shown together under the new partnership and the showing was extremely impressive. The companies had a lot of support at the event, including current World Champion Travis Grant and his winning NSP 17’10” unlimited SUP. The board is the first production unlimited on the market and the only production SUP to win a World Championship. Joining Travis on the beach was legendary shaper Joe Bark who was on hand to debut several new race boards. Surftech’s new collection of boards are connected through color and design anchored by an expanded adventure touring lineup and their new Bamboo Carbon Composite (BCC) construction. The new BCC combines a layer of bamboo, carbon fiber, over a core of fused EPS foam, making it light, strong and unlike anything currently in the market. The boards are bright, fun and speak to the discerning paddler with just the right mix of color, natural bamboo all wrapped around an extremely versatile shape that is both fast and stable. Complimenting the new touring shapes, Surftech, has expanded their inflatable lineup with new shapes with coordinated color pallets. The “Transport Air Series” (TAS) boards are incredibly ridged, yet extremely compact for the adventurer who is looking to travel the road less traveled. The three distinctly different shapes provide options for every style of paddler and have the right accessories to handle the most challenging environments. The new highly anticipated 2016 BARK “Vapor” was the talk of the on water demo and did not disappoint all those who came to paddle it. The new 12’6” and 14’ race board was blowing minds and, as one paddler described it “it was like the Dominator and the Downwinder had an angry fast baby”. The board’s unique new shape, is wrapped in hot orange, black and grey which make the board look fast even when sitting still. The boards will no doubt be a staple on the 2016-racing scene around the world. The NSP 2016 lineup stands out, with the first unlimited SUP race board at 17’10”, followed with a fleet of 14’ and 12’6” racing SUP’s making for an impressive quiver of fast and furious racing equipment. The highlight for the retailers who were flocking to the tent to have a go at paddling the actual board that won the 2015 Molokai2Oahu World Championship and take some pointers from the World Champ himself. NSP also had a their new line of “Cocomat” boards. The boards use the natural fiber from coconuts to create an ultra-high strength, lightweight construction that creates unique patterns and variation in colors giving every board a unique custom appearance on each board. The new recreational boards were on the water from before the event started to long after it finished and were a hot topic of conversation with many of the retailers who came to the demo. The Outdoor Retailer show opens today in the Salt Palace in Salt Lake City, Utah and gathers together the biggest names in the outdoor sporting industry. 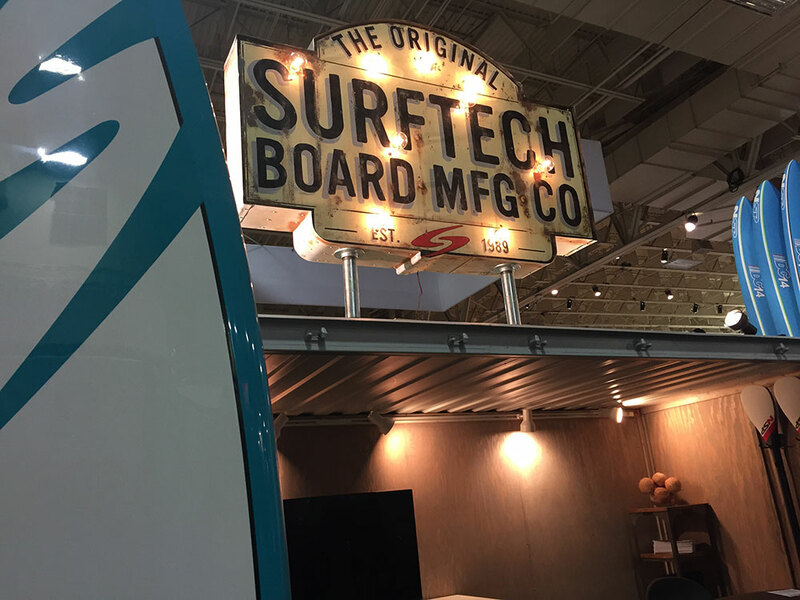 NSP and Surftech are debuting a new booth (Booth #38112) for the show that connects the brands and shows the full lineup of boards and accessories. Surftech, “The original board manufacturing company,” was founded in 1989 in Santa Cruz, California by Randy French. A pioneer of composite technologies, Surftech was the first company to introduce composite manufacturing to the surfing, paddling and SUP industry. Surftech’s business model has always been about board builders, giving them a way to scale and expand their businesses with a seamless solution that compliments their existing lineups to meet demand. NSP is the Nature that brings us together to enjoy the best of this planet Earth, the Science in our approach the development of our product and the Passion that we share to continue to drive and improve our experiences in the water together.